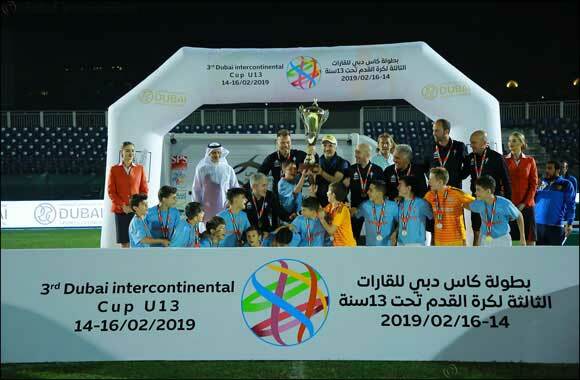 February 17, 2019 - DUBAI UAE// Celta de Vigo, winners of the first edition, clinched the crown for a second time on Saturday night, defeating Juventus 1-0 in the Gold Cup final of the 3rd Dubai Under 13 Intercontinental Cup Football Tournament. The winners received their trophy from HE Saeed Hareb, Secretary General of Dubai Sports Council (DSC), after prevailing over the Italians at Dubai Sports City. Khalid Al Zarooni, Chairman of Dubai Sports City, and Michel Salgado, the Tournament Director, were also present on the occasion. Earlier in the semi-final, Celta Vigo defeated Barcelona 2-0, while Juventus prevailed 3-2 over FC Twente of Holland. In the playoff for third place, Barcelona defeated FC Twente 3-1, while Al Ahly of Egypt edged Italy’s Levante Azzuro on penalties in the Silver Cup final following a 1-1 draw. Along with his winner’s medal, Celta Vigo’s Oscar Marcos Santamaria also picked up the Best Player of the Tournament and the Top Scorer awards, while Juventus’ Matteo Cabella was named the Best Goalkeeper of the Tournament. Celta Vigo had won the inaugural edition of the tournament in 2017, defeating Real Madrid 1-0 in the final. Real had reached the final last year as well, but lost 3-2 on penalties to Lizzy Sports Club of Ghana following a 1-1 stalemate. Real, however, failed to reach the last four this time, losing on penalties to Juventus in the quarterfinal after a 1-1 draw. “It has been a fantastic weekend of football here at Dubai Sports City - you can see all the teams have really enjoyed themselves and learnt a lot along the way,” said Salgado, a former Spain international and Real Madrid legend. “I thank the Dubai Sports Council for supporting this very important and unique tournament for young players, and I also thank Dubai Sports City for hosting us. This tournament is like a baby to me and I dream of seeing it become the most important grassroots tournament in the world. Ali Omar, Director of the Sports Development Department in Dubai Sports Council, added: “This is a unique football tournament and in line with the strategic plan of Dubai Sports Council, aiming to give our young Emirati players a chance to compete against top talents from around the world. “This year we saw five local UAE teams –Al Nasr, Al Wasl and Shabab Al Ahli Dubai, Al Wahda and Al Ain – participate in the tournament and I am sure all of them will take a lot of positives from their participation over the past three days. Held under the aegis of Dubai Sports Council, the 3rd Dubai U13 Intercontinental Cup had attracted 20 teams from five different continents, and the list included top European clubs Real Madrid, Barcelona, Chelsea, Juventus, Celta Vigo, FC Porto, FC Twente of Holland and Levante Azzuro. The other overseas teams were Egypt’s Al Ahly and a team from Cairo, along with a Tokyo Select All Star team and JEF United Chiba from Japan, Australia’s Pascoe Vale FC, and the Canadian Academy of Futbol.